Brian was born and grew up in Leicester and Lesley grew up in London. Brian moved to Norwich with the Shoe Trade and later, due to the demise of the shoe manufacturing industry turned his skill to manufacturing leather handbags. When Brian and Lesley met in 1976 Lesley then left London and came to Norwich. 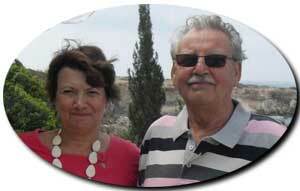 They have lived in St Edmundsbury since 1979 and have been running the B&B since 1989. They have twin daughters, Katie and Amy, now 26. Katie is currently living in Melbourne, Australia, and Amy lives in Norwich. Brian and Lesley are both passionate about their lovely garden and spend many hours keeping it looking great. If work allows, Brian likes to play golf three times a week, although he is still not much beyond beginners' level! Old Costessey (pronounced Cossey) is situated in the valley of the River Wensum, which originates in North West Norfolk and flows through the middle of Norwich City. The earliest recorded settlement here was about 1450 when the old Manor House was built. The first Post Office was not built until 1850, and was situated in the front room of the old White Hart Pub. This was replaced by a new building in 1898, and in 1913 the telephone exchange was added. St Edmunds Church, just opposite the Bed and Breakfast, was built at the start of the 14th Century, and improved over the next two hundred years. At times, it fell into a poor state of repair, notably between 1558 and 1700 when an Act of Parliament enforced all Roman Catholics to abolish the celebration of Mass, and to attend their English Church, the failure of which could lead to imprisonment for life!